Pure pleasure is yours with this spicy, woody fragrance. This bar combines essential oils of sugandha kokila, also called laurel berry (Cinnamomum glaucescens), with bay laurel (Laurus nobilis). Both are stellar fragrances from the Laurel family. The aroma is aromatic and spicy, camphor-like, warm and woody. Sugandha kokila comes from the berries of a tree that grows in the Himalayas in Nepal. The scent is not well known in the U.S. but treasured in perfumery. We previously named this bar Laurel Leaf and Berry. Added castor oil makes a fluffy, moisturizing lather. The creation of this bar has recalled this message from a customer in Belgium. 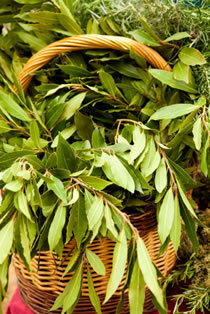 The laurel leaf traditionally symbolizes victory and high status. Imagine how you'll feel, starting your morning with such empowered suds!